Think twice before buying Christmas dogs. A Christmas puppy is a living breathing animal, not a disposable toy. 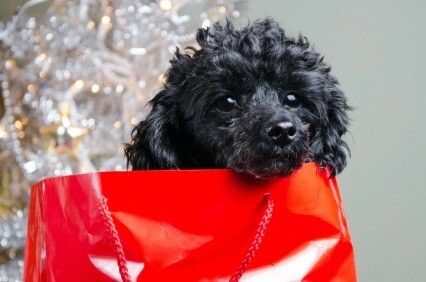 Holiday dogs should be purchased with the intent the family will own the dog for up to 18 years. You've seen that cute poodle puppy walking around your neighborhood and your kids have been bugging you to get them a dog. You know that poodles don't shed which would be great for your son's allergies. 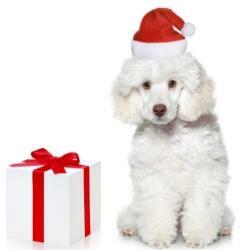 Christmas is right around the corner and you're planning to ask the neighbor which breeder he got his poodle from. You have a Christmas bonus coming at work and what better way to spend it than on a cute curly haired puppy! Wait! 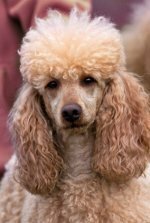 Be absolutely sure you, your spouse and kids are ready for a poodle puppy! Christmas puppies are babies and are a big responsibility, financially and time wise for years and years. This is a living, breathing animal, not a toy to be played with a few times and ignored. Are you sure your kids won't get bored with the new pup? Are they responsible enough to take it outside to potty every hour until he's trained? Or will the excitement wear off as the kids get bored of having to care for the pet? Then who will water, feed, potty and exercise him? Probably you! Instead of surprising your family with a poodle pup, it's best to talk it over, discuss who will handle what duties, assign potty times to each member and discuss the time and money commitments a new pup will entail. Instead of wrapping a poodle in a bow this holiday season, wrap up a book on poodles that the whole family can read together then read our website. It'll give you insights before you bring the little bundle of energy home for the holidays.